With Google Synchronization, all employees entered in the Amelia Plugin can sync their working schedule with their Google Calendar. Each booked appointment will be created in their calendar with the customer added as a participant. Before you can integrate Amelia with Google Calendars, you must create a “Client ID” and “Client Secret”. 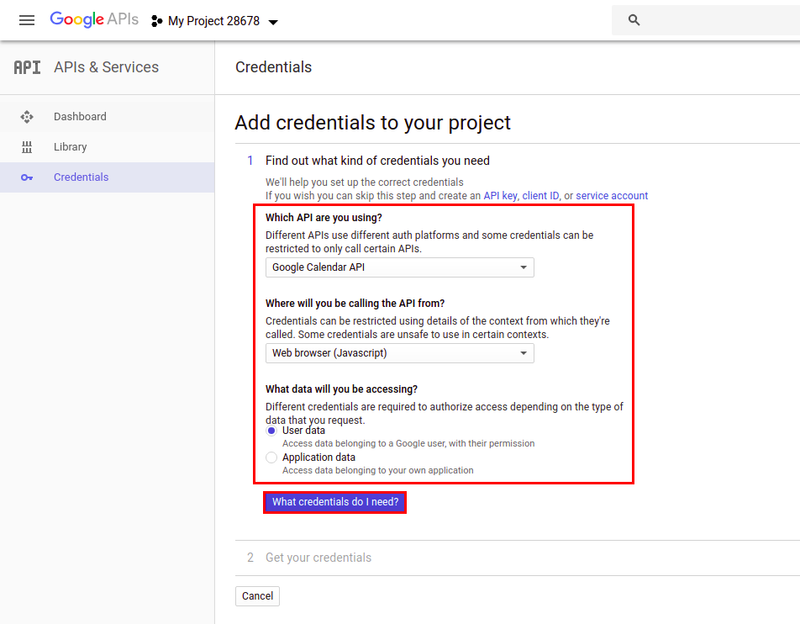 Enable Google Calendar API if it is not already enabled by clicking on the “Enable APIs and services” button. Search for “Google Calendar API”. Click on it, and then click on the “Enable” button. Go back to Google Developers Console and create a new project. To create a new project, click on the “Select a project” dropdown menu. This will open the select project window. Click on the “New project” button to create your new project. Now click on the “Select a project” dropdown menu, select the “All” tab, and open your newly created project. Under the “Credentials” section, click on the “Create credentials” button and then “Help me choose”. 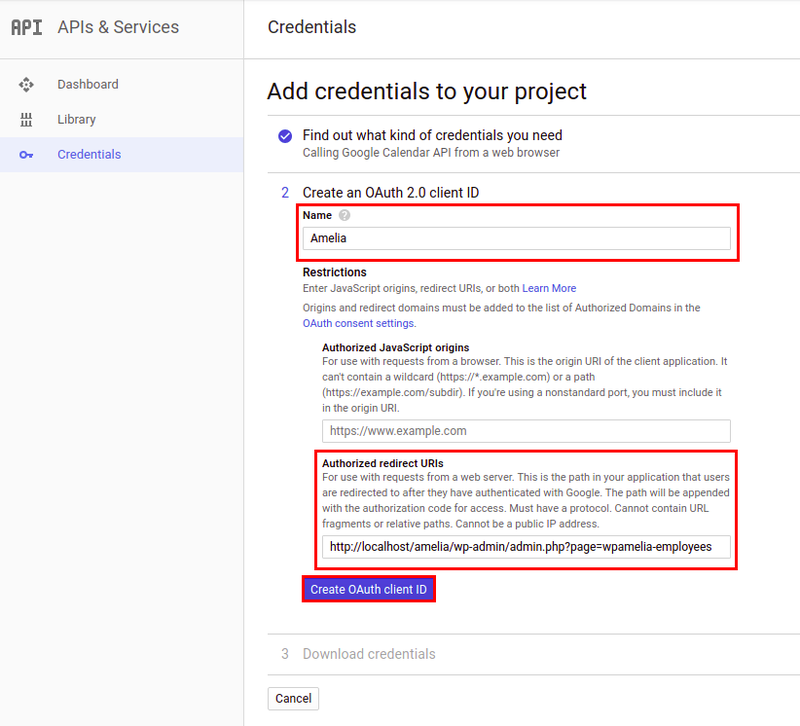 At the second step, give the “Name” of your OAuth client ID and in the “Authorized redirect URIs” field, enter the URL from “Redirect URI” field. You can find the “Redirect URI” field in “Google Calendar Settings” dialog on Amelia Settings page. After that click on “Create OAuth client ID” button. At the third step click on “Done” button. After that select your recently created OAuth client IDs. Copy and paste “Client ID” and “Client Secret” into related fields in “Google Calendar Settings” dialog. 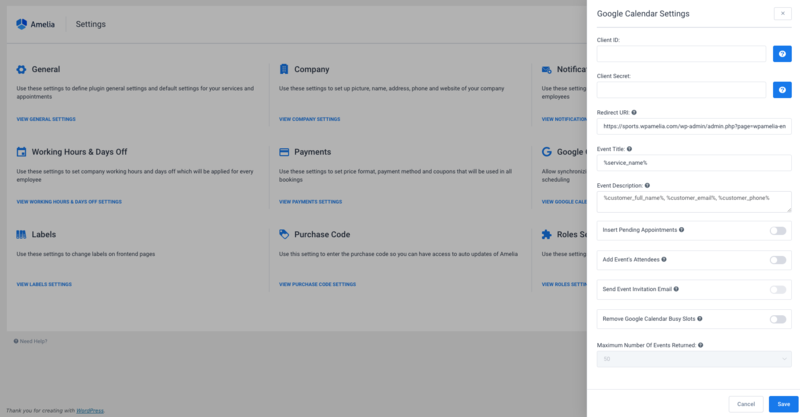 After that, you or your employee (if it has access to the WordPress dashboard) will be able to connect Google Calendar with Amelia from employee edit dialog. Read more at this page to see how to connect employee with the Google Calendar. Read-only field that you should add to “Authorized redirect URIs” field in process of creating Google project. Here you can configure the title of the event that will be displayed in the Google Calendar. This option works with placeholders from the notifications page so to set the title you will need to copy placeholders from the notifications page and paste them here. You will find these placeholders once you click on the </> Show Email Placeholders on the Notifications page. Here you can configure the description of the event that will be displayed in the Google Calendar. This option works with placeholders from the notifications page so to set the title you will need to copy placeholders from the notifications page and paste them here. You will find these placeholders once you click on the </> Show Email Placeholders on the Notifications page. When this option is enabled, appointments with pending status will be added in employee calendar. Enable this option if you want your employees to see in the event customers that attend the appointment. You can share an event with customers by adding them as attendees. This places the event on their calendar. Customers will not be able to see other attendees of the same appointment in Google calendar. This option allows you to choose whether your customers will see other attendees in Google Calendar events if they choose to add scheduled group appointment in their Google Calendar. By default, this option is disabled so your customer will only see him in his events. If enabled, each customer that adds the group appointment in calendar will see other customers as attendees on the list. If enabled, this sends an invitation email to the customers. This option can be enabled, only if Add Event’s Attendees option is turned on. Enable this option if you want to remove the busy slots in your employees’ Google Calendars from their work schedules in Amelia. When enabled, time slots from the Amelia Calendar will be removed whenever there is an event in the Google Calendar. Please note: In order to use 2-way Google synchronization properly your employees should set statuses of the events in their Google calendars as Busy. In that way, time slots occupied by those events will be removed from Amelia calendar. Here you can set the maximum number of events that will be returned from your employees’ Google Calendar into the Amelia calendar. These events will not be visible as they only affect the number of available time slots in the Amelia calendar. Once you’ve completed your settings, there’s one more thing to set on the employees’ side. Each employee should log in and connect to their Google calendar for the synchronization to work. All they need to do is to open the Employee dialog and click on the button beside the Google Calendar option, They will then be redirected to choose their Google Account. Once they have chosen it, they will be returned to their profile in the Amelia Plugin with the selected Google Calendar email (if the account is successfully connected the button should change the color from blue to red). 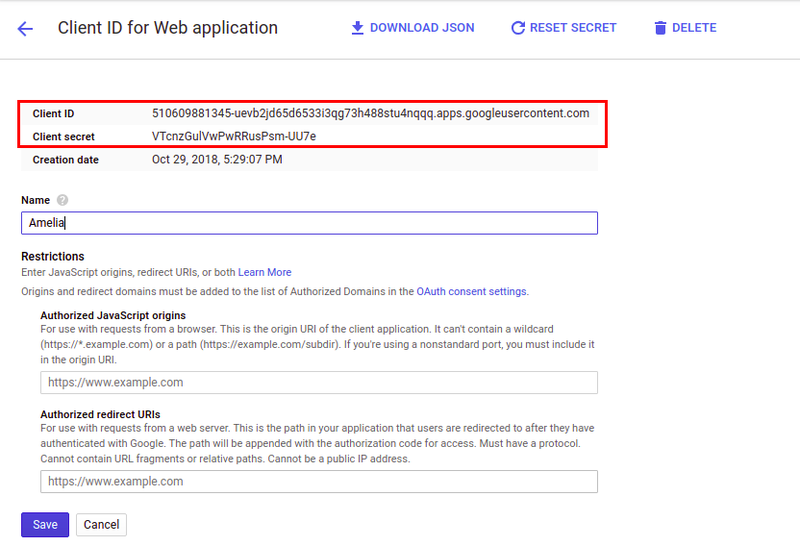 Please configure your security system so that it doesn’t block requests from Google, or click on the browser URL field, delete this part at the end of the URL: “&scope=https://www.googleapis.com/auth/calendar”, and press Enter.